A husband and wife were killed and their two children seriously injured in a car crash in Merseyside. 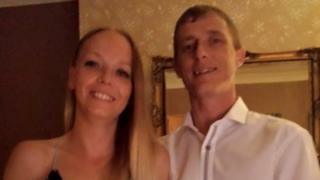 The pair have been named as Mark and Karen Young, both 37, from Ashton-in-Makerfield, who died after the collision in Haydock on Sunday evening. Police said their 16-year-old son and 12-year-old daughter, who were rear seat passengers in the car, are in a "serious condition" in hospital. Mr Young was driving a Volkswagen Golf which collided with a Vauxhall Corsa. A third passenger in the Golf - an unrelated 29-year-man - was critically injured in the crash which happened at about 19:20 GMT on Liverpool Road. Merseyside Police said Mr Young - known as Mike - was driving, his wife was in the passenger seat and their children and the 29-year-old were in the back of the car. The force said the 27-year-old male driver of the Corsa was treated for minor injuries in hospital.